Lugano, Switzerland Solo Launch Press coverage from the Lugano, Switzerland solo launch. Press coverage from the Lugano, Switzerland solo launch. Per l’occasione sono state raggruppate 16 tele di matrice pointillistica attraverso le quali l’artista ci interroga su un tema di stretta attualità: il denaro. Affascinata dalla valuta americana ed internazionale, Jenna Lash propone un’interpretazione rivisitata delle personalità riprodotte sulle diverse divise e le traduce in un’immaginaria moneta dell’Arte. Museen & Ausstellungen Annabel Cruden (Managing Director) präsentierte in der Galleria K10 von Klaus Mühlhäuser eine Ausstellung der amerikanischen Künstlerin Jenna Lash (wohnhaft in Manhattan/NY und Northern Westchester) unter dem Motto "The Art Of Money". The show, Lash’s first in Europe, was assembled by Annabel Cruden, a collector and now promoter of the artist’s work. Passersby and guests at an opening party last week were lured off the sidewalk with a trail of mock U.S. dollars showing George Washington giving an Edvard Munch-like scream. Appetizers were arranged in a massive dollar sign while the sound system played tunes such as Dire Straits’ “Money for Nothing.” Some faux dollar bills were clipped with clothes pins to ficus trees. “It’s not a money tree, it’s money laundering,” joked Christopher Cruden, Annabel’s husband, who runs a $220 million hedge fund called Insch Capital Management AG. Insch has returned about 10 percent so far this year from its electronic trading strategy, which focuses on foreign exchange, of course. Lugano, the provincial capital of Ticino on the Italian border, doesn’t normally crack yucks about bucks. It’s home to Switzerland’s third-largest finance center with more than 70 banks in a town of 57,000, according to the local banking association’s Web site. For the bankers and attorneys viewing the works while clutching tall glasses of prosecco, what they miss most is the money they can’t ever earn back. 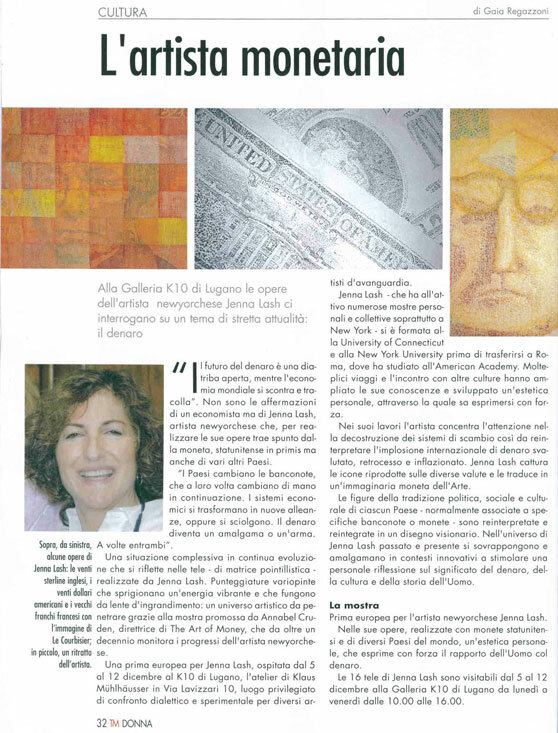 One of Lash’s works, a 60-inch- by-96-inch acrylic diptych titled “Euro-Lire Fusion,” incorporates a brooding Caravaggio image from Italy’s 100,000 lira note, which was replaced by the euro in 2002. “So many people have said they miss seeing that Caravaggio image,” explained Lash, who said she started creating images based on currencies more than a decade ago, initially using an overhead projector to blow them up on a screen before painting. The ubiquity and universal impact of money appealed to Lash, who began painting currency brought home from foreign travel. Lash said buyers of her work include New York law firms and an asset manager in Beverly Hills, California. Some potential purchasers of the paintings in Lugano said her most abstract images had the strongest appeal, if only for jinx purposes. The works, which can only be purchased for real money, range in price from 950 Swiss francs ($791) for an Andrew Jackson image to as much as 18,700 Swiss francs for a diptych of George Washington or the Mexican peso. An image that sold immediately was a Japanese yen Blue Emperor image, listed at 6,700 Swiss francs. “Jenna Lash’s works are of feeling as much as paintings of the external world, and as such breathe a fineness and sensitivity not often found in contemporary visual arts. All existence is in rhythm and rhythm transformations everything and rhythm is the underpinning and, somehow, the inside of or the germ of everything. Color is layered and often indefinite, just as human feeling cannot always be adequately delineated by an overly precise word. The paintings present a realm within which there needs to be room for ambiguity....these paintings aim for simplicity but also for multiplicity: of color, stroke, beat, meter.. Almost everything in this realm is in motion: a beat generated with pattern, near repetitions, relative symmetry, and something of interchangeability. - Claudia Nalven, columnist for "The Journal News"
Brattleboro Museum & Art Center’s annual open call for artists’ submissions brought forth a plethora of exceptional responses. The effort to narrow down this comprehensive and talented group to exhibition size from more than 300 artists was a challenging yet rewarding experience. Walker Roman’s and Shona Macdonald’s paintings evince a dreamlike quality, yet remain based in reality. Jenna Lash’s and Douglas Navarra’s works manipulate recognizable imagery, using source material such as currency and historic documents to examine pattern, iconography, and historical context. Roger Patrick’s bucolic landscapes appear idyllic at first glance, yet emerge peppered with unknown tensions. Ari Chaves’s nostalgic interiors alter our perspective in order to reexamine the domestic and otherwise mundane.